Two of Australia’s major cathedrals were splashed with the colour of martyrs on Wednesday night as a sign of solidarity with those who suffer religious persecution around the world. 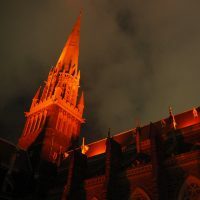 Joining other faiths and landmark public and government buildings worldwide, St Patrick’s Cathedral in Melbourne and St Mary’s Cathedral in Sydney were floodlit red. The stark images were repeated around the world for Red Wednesday, an initiative of Aid to the Church in Need and supported locally by the Australian Catholic Bishops Conference. Red Wednesday was designed as a day to pray and stand in solidarity with all those who are persecuted and suffer unjustly for their peacefully held religious beliefs. The day follows last week’s worldwide release of the biennial Religious Freedom in the World Report, which showed that more than 61 per cent of the world’s population live in countries where religious freedom is not respected. Aid to the Church in Need Australian national director Bernard Toutounji was pleased with the response to the first Red Wednesday event. “A windy and stormy night in Sydney didn’t stop leaders from 15 different faith groups gathering at St Mary’s Cathedral Crypt in solidarity with those persecuted for their religious beliefs. The night was solemn and sombre, but at the same time filled with hope,” he said. “Red Wednesday has also served to highlight the Religious Freedom in the World Report, [which] is both a tool of awareness and education for those of faith and indeed all those of good will who believe that freedom of conscience, thought and religion remain preeminent rights in any society that wishes to call itself truly accepting and welcoming. At Melbourne’s St Patrick’s Cathedral, parishioners and local leaders from a variety of different religions also gathered to stand up for faith and freedom and remember those who had been persecuted for their beliefs. Fr Joe Caddy said the event was a tremendous opportunity for reflection and to come together “as brothers and sisters of all faith groups” and consider “how peacefully we do co-exist and to know that there are many of our brothers and sisters around the world who are persecuted because of their religious beliefs”. The event included speeches from members of the Jewish, Muslim, Sikh, Hindu and Buddhist communities, as well as a lively performance by the Hare Krishna Movement group. Red Wednesday in Melbourne concluded with the beaming of symbolic red lights on the blue stone façade of St Patrick’s Cathedral. This entry was posted in Uncategorized on November 29, 2018 by ACBC Communications.